Here are some yummy quick dinner recipes for kids that young and old alike will love. If you are pinched for time and looking for a simple dinner recipe that is quick and healthy then you have come to the right place. Everyone who has children knows that they can be really funny eaters sometimes. This can be really frustrating – particularly because we so badly want them to love eating healthy foods. A child may love a certain food one day only to reject it the next! I have come up with a few sanity-saving tips that will help give you peace of mind and will also slowly help children to enjoy eating healthy food. 1. 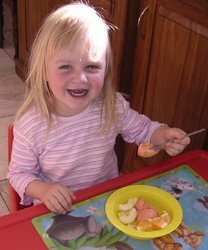 Serve healthy snacks: If your children eat healthy snacks throughout the day then you don’t have to worry so much if they don’t eat much of their dinner because they would have got plenty of nutrients from their healthy snacks. Offer fresh raw fruit and vegetables as well as nuts and seeds first as these are the healthiest choices. Dried fruit can be high in sugar, but is at least much healthier than candy. Pretzels are much better than crisps. Your children may enjoy snacking on a healthy muffin. My healthy muffin recipes are all delicious, very low in fat, high in fiber and many contain fruit and nuts which provide extra nutrients. Allow children to help with preparing the meal. Children love to be involved and helping in the kitchen will get them interested in food and they will also be more excited about eating something that they have helped make. Try to avoid serving foods that are too hot and spicy as younger children do not like them. Serve fruit and veggie finger foods as children may turn their noses up at foods that are mixed together such as casseroles. Younger children prefer to keep their foods separate and may not even like them touching. Don’t make a fuss about children who don’t want to eat – don’t beg them, bribe them or get angry with them. Meal times may quickly become an issue and you don’t want to end up in a power struggle with your child. 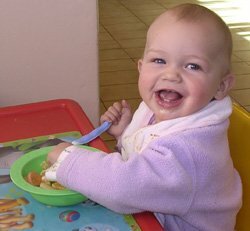 Allow children to take responsibility for how much they want to eat. Forcing them to eat more than they want to, may lead to them becoming overweight or developing an unhealthy relationship with food. Keep portions small. Children are often overwhelmed by large amounts of food on their plate and much prefer small portions. They can always ask for seconds after they have finished the food on their plate. Here is a collection of some my most popular and quick dinner recipes for kids. These easy recipes don’t take long to make at all and are very low in saturated fat and loaded with nutrients. 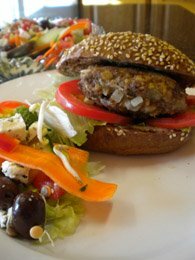 Tasty Burger Recipes - Easy dinner recipes for kids call for some old favorites made a little bit healthier! All kiddies love burgers and these are oh so yummy! Beef and Noodle Casserole - Children aren't generally mad about casseroles, but this one is incredibly tasty and simple ground beef recipes can save the day! My children love this one! Easy Chicken Salad Recipe - This simple chicken salad recipe can use grilled chicken or leftover chicken. It's so tender and juicy ... utterly delicious! Salmon Patties Recipe - This salmon patties recipe is another canned salmon recipes favourite with children, these are so healthy and yummy. Teriyaki Chicken Recipe - Simple chicken recipes can make all the difference in a time pinched day! Children love the flavour of this succulent teriyaki chicken. How to Make Tuna Salad - This tuna salad recipe is juicy and delicious and crammed with goodness. I do hope that you enjoy these quick dinner recipes for kids and that you have lots of fun with them. If you have a very clever way of feeding a picky eater, you can start right here below. Tough Toddler eats vegetables Finally!